Finley let us sleep until 10:00 and then he just had to get us up so we could hang out all day. The sun was out all day and there was no wind and no clouds in the sky. We had unlimited fresh water so we cleaned all the salt off the boat and made her look all shiny and new. Preston got to work on a loose board that had bugged me on the dock since day one and it is now more solid than ever. We went to lunch with Finley where all of us had the best chicken we have ever had. It was a local bahamian joint that a tourist would never find, but we were lucky enough to go to. We stopped at OBS and picked up some more fishing lures and noticed the anchor we traded was priced at $400.00! We also filled a few gas cans and stopped at the grocery store. Finley was excited to say the least that we were back in town. He came down to the boat and played cards for a while trying to convince us to stay another day so we could go fishing again. Too bad we have to follow the wind and we were set to have northeast winds the next day with small seas. It was going to be an easy crossing and we didn't want to fight the weather again. We left Freeport at 7:00am pulled out the sails and started across the Atlantic. The forecast was for 10-15 knot winds from the northeast and 2-3 foot seas. We started with about 10 knots of wind from the east and then it died down to nothing and we put the motors in the water and motored most the way back. A few times the wind picked back up and we put the sails up but kept the motors running too. It was the most perfect beautiful day we have had yet, only no wind. In the middle of the Atlantic Ocean we had no waves and the water was glass. Who would have pictured sitting in the middle of the ocean with no land in sight for hours and water this smooth. We had a group of dolphins join the bow of our boat for a few minutes which was so much fun. Every time we see dolphins we all get so giddy and run to the bow of the boat. The rest of the day was spent reading, laying in the sun, and playing games. We had the fishing lures out all day and just as the sun was setting we caught a big one. 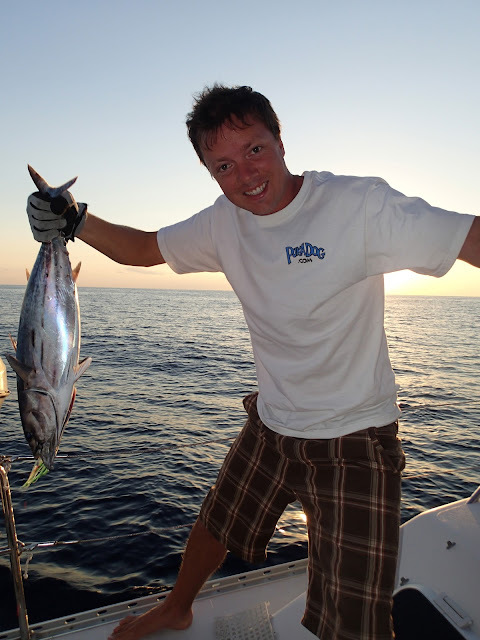 It took 10 minutes to reel in and we had a delicious tuna dinner, with more steaks in the fridge for the next few days. We pulled into Fort Pierce, Florida around midnight and anchored in the ICW for the night just outside our marina. Good work Preston, leaving the dock better than you found it. Sounds like you have made some lifelong friends. What a rush to sail with the dolphins, something I will only experience thru my kids.